Unlike the modelling of genetic regulation networks or metabolic pathways, modelling a laboratory protocol does not necessarily achieve much in light of the ultimate goal of being able to understand and answer questions regarding biological processes. On the other hand, we did wish to construct a model corresponding to the BRIDGE protocol, and such a model would be useful to demonstrate an ability of Kappa that has not been touched upon yet: perturbations. These are described in further detail below, but in short allow for certain effects (such as activation or inhibition of rules) to be enacted at certain times within simulation of the model. The following sections describe, in turn: the agents and rules that are present in the genomic BRIDGEs model, the perturbations that govern time-dependent behaviour, the results obtained by running the simulation, and finally the analysis of the results obtained. 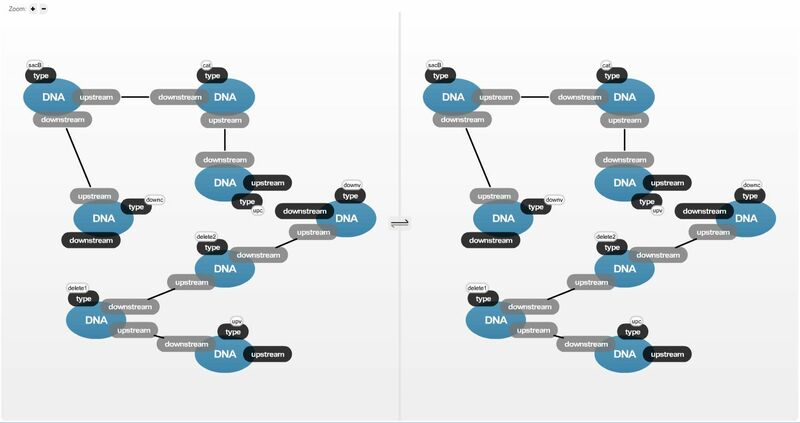 The genomic BRIDGEs model, focused as it is on the interactions of the BRIDGE protocol, requires only one basic agent - the DNA agent presented previously in the introduction to Kappa. Each DNA agent has two lateral sites to bind other DNA agents both upstream and downstream, one to hold the type of the agent (usually materialised either as a descriptive acronym or as a reference number from the BioBrick Registry), and one to bind proteins interacting with the DNA agent (typically transcription factors or RNA polymerase, omitted in this model ). This basic agent, chained together as shown in Figure 1, can then be used to construct larger composite agents that represent different sequences in the BRIDGE protocol - for example, the cat-sacB construct or the desired insert. Figure 1: A composite agent with four DNA agents joined together at their upstream and downstream sites, representing the cat-sacB construct and surrounding DNA. The rules involved in the BRIDGE protocol can be roughly divided into three distinct groups, or chapters. The first chapter involves the introduction of fresh agents to the protocol, and consists of a single rule in which the desired insert (i.e., the DNA that we wish to insert into the target vector during the second stage of BRIDGE recombination) is created. This rule has an unmodified rate of 0, since we do not want this to occur without our express permission. The second chapter involves the degradation of various composite agents under the influence of antibiotics or growth on sucrose, as per the selection methods employed by the BRIDGE protocol. For example, applying antibiotic selection will result in all composite agents not containing a DNA agent with type cat to degrade; similarly, applying growth on sucrose will cause all composite agents containing a DNA agent with type sacB to degrade. Although this is not quite an accurate model of what actually occurs during the selection process, it does allow for the modelling of the protocol to be contained within a single system. Again, these rules will only occur at certain time-points within the model, and thus the rate of the rules are set at zero. The third and final chapter of rules describe the two stages of recombination as previously outlined in Figure 1 on the introduction to the BRIDGE protocol here. They involve the exchange of the relevant DNA agents between their respective composites, an example of which is shown in Figure 2 below. The initial conditions of the simulation are set such that it contains both the cat-sacB construct and the vector into which the final insert needs to be placed. The remaining DNA required for the protocol - the insert itself - will be added to the simulation at a predetermined point in time, as described by the perturbations to follow. For details of the rules themselves, readers are directed to browse the actual Kappa model. Figure 2: A Kappa rule describing the first stage of recombination in the BRIDGE protocol. The cat-sacB construct is exchanged between the two composite agents. Perturbations in the Kappa modelling language are simply timed alterations to the rates of particular rules, simulating the effect of external influences upon the modelled environment. In the context of modelling genomic BRIDGEs, the perturbations describe the effect caused by various stages of the protocol - selection over antibiotic resistance, introduction of the insert, and selection over sucrose. Hence, there are again three sets of perturbations included in the model. The first set of perturbations deal with antibiotic selection, regulating at predetermined time points within the simulation the two relevant rules described previously. Four separate perturbations are required in total - two to activate the rules (i.e. set their reaction rate to a value greater than 0), and two more to deactivate them again (i.e. reset their reaction rate to 0). Similarly the second set of two perturbations activate and deactivate the introduction of the insert, and the third set of six perturbations do the same thing regarding selection over sucrose. Again, for the perturbations themselves, readers are directed to browse the actual Kappa model. As the model itself was relatively straightforward, there were very few complications in designing the rules and perturbations to achieve the desired results. These can be summarised as depicted in Figure 3 below. Initially, a thousand composite agents for each of the BRIDGE construct and the vector exist within the simulation. Over the first few time units, these interact with one another via the rule governing first-step recombination, diminishing in number as the integrant is formed instead. At t=5, the perturbations for selection over antibiotic resistance are activated, and over the next five time units the amount of the vector in the system declines, leaving only those agents containing the cat BioBrick (non-recombinant construct and the integrant) in the system. At t=10, the insert is introduced into the system, and interactions with the integrant as governed by the second-step recombination rules begin to occur. This results in the amount of integrant in the system decreasing, and the amount of product increasing in turn. At t=20, the second stage of selection perturbations are activated, targeting those agents still containing the sacB BioBrick (including non-recombinant construct and the integrant). This leaves a final system containing large amounts of the desired product, as well as any insert that has yet to interact with the integrant. Repeated simulations of the stochastic model resulted in graphs very similar to the one shown. 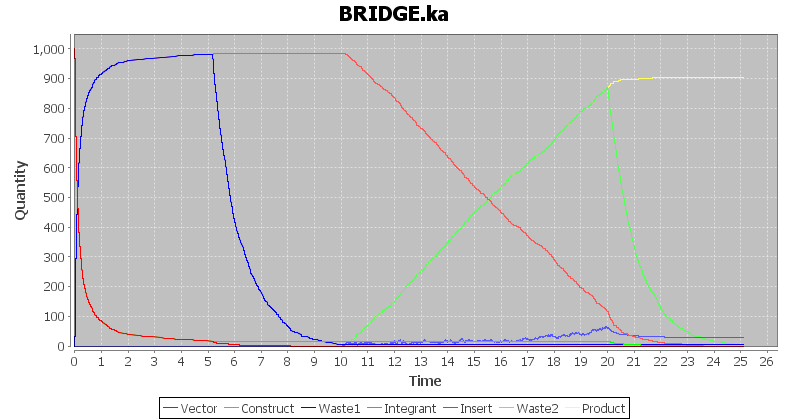 Figure 3: Results of running a simulation of the BRIDGE protocol. Units (time and concentration) are arbitrary. In the above simulation results, the final state of the simulation contained both the desired product and remaining insert. As this is obviously undesirable in the finalised protocol, it thus highlights the need to carefully control the amount of insert added to the integrant before second-step recombination. In addition, in some runs of the simulation the selection perturbations failed to completely eradicate the waste DNA from the system. Although this is a side-effect of modelling the selection mechanisms as has been done (i.e., as degradation of previously existing DNA), it also emphasises the necessity of allowing them to run their course before continuing to the next stage of the process. On the other hand, it can be argued that this is less of a concern in real life, as if even a small amount of the correct DNA can be isolated, it is relatively easy to amplify this via other means such as PCR. Once again, the finalised model can be found here.